My kids have a love affair with french fries – McDonald’s french fries. But we don’t buy them anymore. I’m not fond of making french fries either. Lots of cutting, lots of mess when frying. I leave that to my husband who makes a mean french fry in coconut oil. Instead I came up with an easy alternative that can be made with the assistance of my helpers – roasted potato wedges. All of my helpers do the scrubbing of the potatoes. The six year old can handle cutting up the potatoes sometimes, when he’s in the mood. Frequently I do it, but cutting wedges is less tedious than cutting slices. Roasted Potato Wedges make for an easy weeknight side dish. I can prepare these while helping the kids get home from school, and pop them in the oven about an hour before dinner is ready. If I wash the potatoes early in the day and leave them in the drying rack, I only need to cut up the potatoes in the afternoon and flavor them. Wash and cut the potatoes in bite-size or slightly large pieces. The smaller the potato piece, the faster it roasts in the oven. After pouring olive oil over the potato wedges in a bowl, and sprinkling on paprika, salt, and pepper, and sometimes rosemary, one of the helpers mixes everything so that the wedges are completely coated. After spraying a Pampered Chef stoneware pan, I spread the potatoes in a single layer on the pan, and then bake them at 450 for 45 minutes or until done. Always spray the pan to prevent sticking. I like to use the coconut oil spray from Trader Joe’s. delicious! 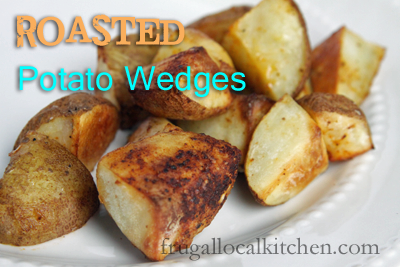 and, you're right, cutting them into wedges is much better than fries I do the same thing with sweet potatoes. I'll have to try that! I have at least 5 lbs. of sweet potatoes that I picked up from the reduced section of our produce store. Maybe I'll try it tonight as a side for our leftovers. Yum! WE love doing oven roasted taters! I love any idea that replaces fast food fries!